As part of our project with the National Institutes of Standard and Technology on Standard Test Methods for Robotic Systems, Robolit will be taking part in the DARPA Robotics Challange (DRC) tests. We will be overseeing the tests and provide evaluation support for the NIST team responsible of the challenge setup. Seventeen teams from around the world will be participating in the DARPA Robotics Challange (DRC) Trials at Florida’s Homestead Miami Speedway, December 20-21, 2013. 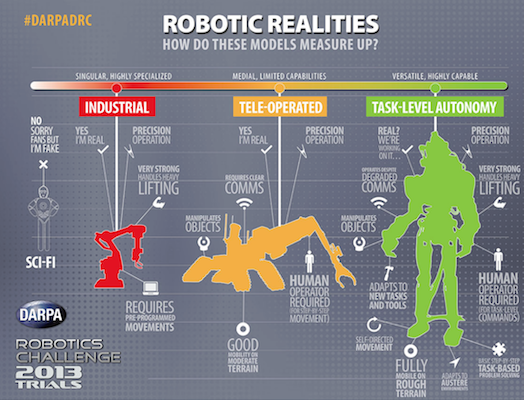 The Trials will provide a baseline on the current state of robotics and determine which teams will continue on to the DRC Finals in 2014 with continued DARPA funding. Competing in the 2014 Finals will lead to one team winning a $2 million prize.